Of late, Havana cigars are in vogue. Forget the embargo, they rank first in contraband coming through New York City airports. In 1970 I smoked my first rum-soaked Cuban cigar and drank Havana Club and lime straight, thanks to the Captain of a Cuban ship docked in Veracruz. Mexican police stood at the gangplank to make sure no Cuban nationals disembarked—orders from Yankee headquarters. The Captain, gracious as he was, presented me with more cigars, pins commemorating the revolution, and the word that I should look for the Cuban music he was playing on the cassette player. The US government’s blockade against Cuba has come to be seen, little by little, as a mere rock in the road. Culture always seems to find its way around such obstacles. Two US jazz musicians were instrumental in breaking the blockade for the sake of jamming with Cuban musicians: Dizzy Gillespie orchestrated a jazz cruise to Havana in 1977; and two years later, magically real as it was, CBS airlifted a recording studio in to record a double LP. Aptly titled Havana Jam , the legendary Cuban band Irakere started the party led by pianist Jesús “Chucho” Valdés. Along with trumpeter Arturo Sandoval and saxophonist Paquito D’Rivera, Irakere appears again on side three among various bands that featured Stan Getz, Dexter Gordon, Cedar Walton, Percy Heath, Joe Zawinul, Jaco Pastorius, Wayne Shorter, Peter Erskine and Tony Williams. Heeding the captain’s advice, I bought Havana Jam when it came out in 1979; it still sounds great. Cuban pianist and composer Jesús “Chucho” Valdés, for 25 years associated with Irakere, was born in Quivicán, Cuba. Chucho is the son of pianist, composer and bandleader Ramón “Bebo” Valdés of the famed Tropicana house band. Trained early on in classical piano, Chucho grew up hearing the pioneers of Afro-Cuban jazz who assembled in his home, and the parade of jazz stars like Nat King Cole and Erroll Garner who flew in from Miami to play at the Tropicana on weekends. Chucho Valdés’ band Irakere won a Grammy in 1978, which he didn’t receive until Bruce Lundvall, former head of CBS records and currently of Blue Note Records, personally hand delivered it over to the bandleader in Cuba some ten years later. Two Messidor recordings, Misa Negra and Homenaje a Beny Moré , brought the pianist further international acclaim. In the nineties, Valdés’s mid-December Cuban Jazz Festival accelerated the flow of jazz groups and their fans, mostly from Europe and Canada, into Havana. In 1996 Roy Hargrove and his band were invited and soon enough, this trumpeter reconfigured his touring band to include Chucho and several sizzling percussionists, named it Crisol and they were off. A festival favorite in Europe, Hargrove decided to record with Crisol. It was easy, he named the CD Habana (Verve, 1997) and this year it won the Grammy in Latin music. With more frequency, Chucho Valdés has been performing in the US. He recorded Jammin’ in the Bronx with the All-Star Latin Jazz Ensemble, and sat in on a standing-room-only gig at Bradley’s the week this renowned Manhattan jazz club closed. He performed at New York’s Central Park, Lincoln Jazz Center and the Jazz Gallery. It’s quite a trajectory, but Chucho Valdés’ Bele Bele en la Habana (Blue Note) sizes up his current state of mind—making music, making jazz, putting Afro-Cuban rhythms in the heart of it all. Zoë Anglesey After hearing you in concert, I’ve come to realize that “Afro-Cuban” is a very huge umbrella for lots of music. I think maybe it’s a narrow concept to us because we’re not exposed to all of its great forms. What are the Afro-Cuban forms in particular that you are dealing with on your new recording, Bele Bele en la Habana? Jesus Chucho Valdés There are some Cuban standards, some of my own compositions, Latin jazz, and jazz standards, and what ties it together, what creates unity is the internal Afro-Cuban aspect of the music. Latin jazz and Afro-Cuban jazz are sons of the same mother. I consider Afro-Cuban music to be more closely connected to African music, especially to Santería. Latin music is thought to be closer to the roots of the son, an Afro-Cuban musical genre that originated at the turn of the century. [Son is an antecedent of today’s salsa music, and like ragtime, the son blends African and European elements.] It’s dispersed widely throughout the Caribbean. ZA What about your solo album? How is it structured? JCV The solo album relies on two languages—Afro-Cuban and American jazz. I play some Cuban tunes like jazz, some jazz tunes like Cuban music. And there are some tunes that I play as strictly Cuban and others where I go for pure jazz improvisation. JCV In different styles, but there is one thing that is bilingual: the eight chords that are purely Cuban, and the harmonics that are pure jazz. I go from one style to the other. ZA How did you find the reception in New York? JCV I’ve always been well received. This time I think it was much better, maybe because they know me a little bit more, after the solo concert at the Jazz Gallery and the work I’ve done with Roy Hargrove and the Lincoln Center Big Band. ZA I noticed that Bruce Lundvall [with Blue Note] had something to do with the 1979 recording of Havana Jam . I guess that means you’ve had a long relationship with him. JCV I have a lot of affection and admiration for him. ZA What’s it like having an association with good people like Bruce and René Lopez, your producer? JCV I’m working with people who are on the same wavelength; there’s great unity in what we’re doing. ZA So the result could only be a good recording. (laughter) Since the revolution, how has music fared in Cuba? JCV It has developed a lot, especially the Cuban rhythms. The music styles have been changing, and after 1959 it really started to happen fast. All of a sudden from one day to another, the rhythms took on different forms, and that’s mainly because of the percussionists. They are the strongest element of Cuban music. ZA Is that because people of African descent felt like they could participate? Were they able to express themselves more? JCV The ’60s were an era of great creativity. We started developing rhythms from Mozambique; and then again, many of the percussionists wanted to develop their own rhythmic persona to make their music recognizable as their own. Some of those percussionists were not good at all, but some of their musical concepts remain. In this way Afro-Cuban forms became very varied. The big changes really started to come in the early ’70s. You can see a definite difference after that. ZA You yourself play percussively. You’re physically large, like Randy Weston or McCoy Tyner. You have large hands. When you play the piano, it’s obvious that this effects your music. Have you ever thought about that relationship? JCV That’s a characteristic of big people. I am always thinking about the percussive elements when I play the piano, and the polyrhythms from percussion—not all the time, of course, but part of the time. ZA Are there good music schools in Cuba to learn jazz? JCV There are very good schools in terms of teaching or contributing to a student’s musical formation—mostly classical. Now we have the Beny Moré music school that teaches popular Cuban music. Occasionally, I give courses in jazz at the School of Fine Arts. A lot of the younger music students are listening to jazz. ZA Given the fact that there’s a shortage of money and resources, how do people get CDs to listen to, or the old LPs? How do they hear the jazz that’s coming out? JCV It’s not easy! We, the people who travel and the musicians who’ve been around, inform them as we get the material, then everybody copies the stuff. Now with videos, it’s better because they’re seeing them perform also. ZA I wanted to ask about your own history. Who were the first jazz musicians you saw as a young person? Who caught your attention? JCV As a child, first, my father. He was a very good piano player. In his house he played jazz: the music of Ellington, Basie, Glenn Miller’s band, the Dorsey Brothers. I’ve been privileged. Because at that age I was able to see the jazz legends in person. My father was the piano player at the Tropicana. He took me to see Nat King Cole and Sarah Vaughan when I was child studying music. You can’t imagine, you can’t calculate the impression they made on my life! Enormous! Magical! I never thought about not playing that music. It was my dream to be a jazz piano player and it was the dream of my father, even though we studied classical music and wanted to play Cuban music. When we heard Nat King Cole play the piano, I thought I was in heaven! ZA When you heard Nat King Cole, was he playing with his trio? JCV Yes, and the big band at the Tropicana would accompany them. ZA Oh wow! Are there any recordings of that? JCV Yes, they recorded in Cuba, Cole en Español . My father was the piano player [with the Tropicana Orchestra] on all of Nat King Cole’s recordings made in Cuba, and he was responsible for four of the arrangements on the record. ZA You should go into the reissue business. JCV Yeah, but everybody’s taken that route already. JCV They had jam sessions with Stan Getz, Zoot Sims, Philly Joe Jones … the best. They would come from Florida and in 40 minutes they were in Havana. They would play on Friday, Saturday and Sunday, then on Monday they were back in Florida. I never missed one jam session, ever. ZA So you were in the best school. ZA With this quality of music, the patrons must have been from everywhere as well. JCV They had a place called the Cuban Jazz Club and on Sundays there would be all night jam sessions with US musicians like Philly Joe Jones and others. ZA In Havana, is there a renewed interest in jazz? JCV They have never stopped listening to jazz, ever. I used to record and tape programs by Willie Conover from the Voice of America, the Jazz Hour, everyday for 45 minutes. JCV That’s a great idea. ZA I want to ask about Oscar Peterson, Art Tatum, some of these people who have had an impact on pianists in Cuba. JCV Art Tatum affected everybody. Peterson comes from the Art Tatum school. He has a different feeling, but he has a lot of Art Tatum’s influence. I studied Peterson for years. He’s one of my favorites. JCV Erroll Garner was a virtuoso. ZA I don’t think he gets enough attention. JCV People should listen to him. ZA He started to use the Cuban percussion. JCV He made a record, Garner Plays Mambo or Mambo with Garner . He had a tireless left hand, he used to let it lay back on purpose. He had an incredible concept of time. ZA So how is it that someone can do that? Some people just have that special talent? JCV It comes from God. You can’t teach that in school. ZA I want to know about Bill Evans. When did you first hear him? JCV The first time I heard him I couldn’t finish listening to the record, because tears came to my eyes. I realized my sound wasn’t good enough. I was 23 years old and I went to see my music teacher. I gave her the Bill Evans record and I told her, “Someday, I hope that my piano playing will sound something like this.” We started working to achieve that—the harmonic concept—”Waltz for Debbie,” Live at the Village Vanguard , it was unreal. Bill Evans was a tremendous poet with a concept different from all of the other piano players. For many years, I studied Bill Evans’s sound, his manner of expression. The problem is, I had an affinity for Bill Evans because what he did, is what I felt. He played like I wanted to play, in a very expressive way with a gorgeous sound, especially because of the way he used the pedals. However, I’m not going to say he was the best or my favorite, because I’d exclude others. ZA Who are some of the others? JCV McCoy’s a big influence. McCoy took me on another path—a strong rhythmic path. Herbie Hancock too. Keith Jarrett, Chick Corea, but less so. I liked McCoy and Herbie more, and also Cecil [Taylor]. Dave Brubeck impressed me a lot. When I used to play classical music, I started hearing Brubeck’s classical approach which was impressionistic at the same time. It reminded me of the French composer Darius Milhaud. I like him. Of course, Cecil Taylor—I consider him a virtuoso within his style. They’re all good. ZA When did you first hear Cecil Taylor? JCV The first time, I didn’t understand what he was doing. That was a long time ago. My ear was adapted to another type of sound. I heard him playing with Kenny Dorham and Coltrane. I thought what he was doing was weird. But then I heard his feel. ZA Who are you listening to right now? JCV Keith Jarrett from the ’70s. I liked him when he started out with the [Charles] Lloyd Quartet, but in the ’70s he was even better. ZA Since Irakere has been together for 25 years, are you planning to produce reissues or some box sets? JCV They’ve already done a compilation of those recordings in Cuba of 11 CDs from Bacalao con Pan to 1982. ZA Are they being distributed outside of Cuba? ZA What’s your favorite recording with this band? JCV The one that won the Grammy [with Irakere in 1979]— Misa Negra and Homenaje a Beny Moré . ZA I understand that your son is now leading Irakere? ZA Like father like son? JCV We think along the same lines. Of course, he has his own personality. ZA I think that the public is aware that “salsa” has kind of gone stale. There’s a buzz in the air that more and more Cuban music will be arriving on the scene. JCV I agree with that. The musicians are looking forward to that. Salsa is dying from repetition. ZA The people who are lucky enough to be in New York and lucky enough to have been at your concerts are looking forward to this music thinking that this is going to start something. JCV I think the quartet I just recorded with is something new. It’s a new concept. Very fresh. It’s because of that mixture I was talking about, ideas coming from all the band members. That’s how I could make the record. It’s the result of all our ideas. ZA Are they cooperative arrangements? JCV The arrangements are mine, but the ideas came from a collective effort. They changed some of the stuff. They made some things better. I also think the concept of the solo piano is different. It’s not one path, it’s open-ended. It’s all there with the two languages. ZA So you’re excited about these two recordings? JCV It’s been years since I’ve felt like this. The concerts I’ve done have given me new ideas. The public has demanded new ideas, and I feel that I am going to continue to evolve and take the music logically through to its evolution. ZA I wanted to ask you about that cruise that Dizzy Gillespie organized. JCV I remember it was the month of May in 1977. When Dizzy and the other musicians landed in Havana, they played music straight for 48 hours. We jammed taking shifts. That’s when Dizzy heard many of us play. Thanks to that opportunity, Irakere was invited to the US in 1978. Dizzy recommended us. He disregarded the cultural embargo. Dizzy helped a lot of people, not only with his music and his ideas, but as a human being. ZA Where there were problems, Dizzy found ways to get around them. Do you feel a responsibility because of your opportunities and experience? JCV Little by little I’ve been able to fulfill a commitment with my public. I’m not standing still within one certain style because there’s always more to do. Until recently, my job was with Irakere. Now I have the ideas that suit a quartet. But I’m still looking for a new path for myself, especially in terms of improvisation as a pianist; that’s demanding yet it’s gratifying at the same time. ZA I was just thinking that with the Pope in Cuba, and Fidel being on TV in the US, the arts and music have already brought people together. People really don’t care about the old politics. JCV Yes, music has always been a unifying force. Today we’re still in the meta-unity of Charlie Parker and the respect that Charlie Parker commands over any other problems that might be occurring in the world. It’s not that musicians live in a separate world, but they live within the music. We talk about Coltrane as if he were still alive. Our Jazz Festival started in 1980 with very few people. Today, we have eight sites and we can’t accommodate all of the people into the sites. Yes, I think the Pope’s visit and all of the other things that have happened will allow the Cuban Jazz Festival to go to another level. ZA So you’re going to continue to direct the Havana Jazz Festival [mid-December]? JCV Yes. Every year I say I’m not going to do it, (laughter) but when it gets close I can’t contain myself. Interpreted by René Lopez, co-producer of Bele Bele en la Habana (Blue Note, 1998) on January 28, 1997 at the Jazz Standard. Zoë Anglesey wears a variety of hats (literally). She writes for Down Beat and Jazziz. Her translation of a Lourdes Casal story will appear in Dream with No Name: Contemporary Cuban Fiction (Seven Stories Press, 1998). She is an editor of an anthology of ten young poets to be published by One World/Ballantine in 1999. 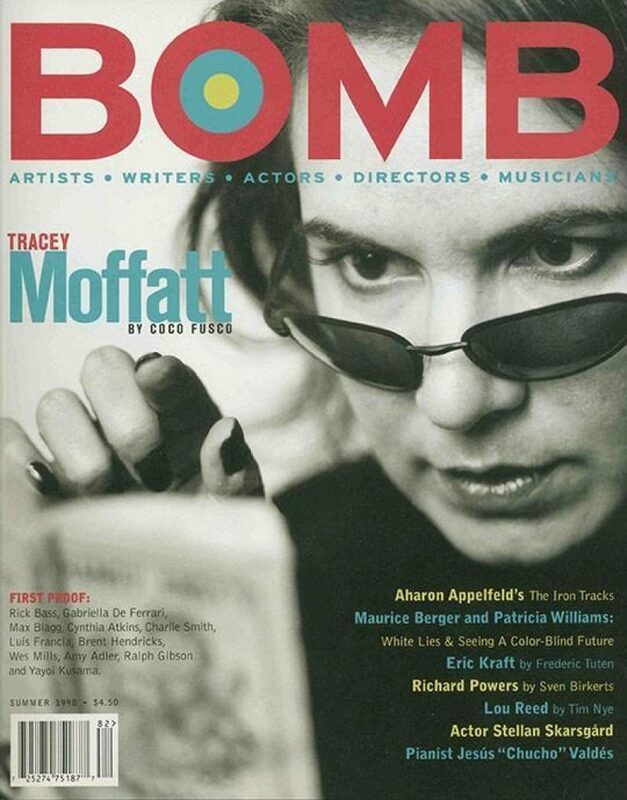 Featuring interviews with Tracey Moffatt, Aharon Appelfeld, Eric Kraft, Maurice Berger, Patricia Williams, Richard Powers, Stellan Skarsgard, Jesus “Chucho” Valdes, and Lou Reed.